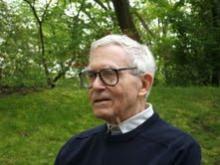 Home » News » Robert Lane, Eugene Meyer Professor Emeritus, passes away at the age of 100. Robert Lane, Eugene Meyer Professor Emeritus, passes away at the age of 100. Robert E. Lane, Eugene Meyer Professor Emeritus, passed away just before the New Year, at the age of 100. Professor Lane, a pioneer in the field of Political Psychology, and a former chair of the department, spent most of his career at Yale, where he trained dozens of students. You can read more about Professor Lane, his work and his life in the following articles. You can find Professor Lane’s departmental bio here. Ian Shapiro will be organizing a session at APSA next year on Bob Lane’s research, the details of which we will pass along in due course.